Commisions#sketch, beagifted, cats, Katzenworld, kittens8 Comments on All Catz! I laid aside yesterday’s Monday Evening post, and took the days prior to get better, and I am 😀 After much tea and vitamins and seeing the super freakin awsome Avengers, Age of Ultron, I am pumped and ready to go! and I’m excited to introduce, the last two sketches of the kitties from Katzenworld, Catto and Angel! “Catto is a very curios boy that always wants to check out what is going on and puts his nose into things haha! He has his cuddly moments and likes to play. While he loves his human parents he is not good with other animals of any species! Naturally I drew Catto curiously exploring things with his nose, and something about Angel suggested I should draw her in a majestic way– so that’s the rout I took. Now for the full spread! Since doing the last two sketches I’ve been able to see all the cats as one big picture– so I made some changes to make all the art a bit more uniform in appearance across the board. All the cats now have the same type of eyes– where as before some cats looked like snowball, while others had whites in their eyes. I also scaled all the cats, mostly their heads, to be the same size in each image, so your eyes flow steadily through each one. I also gave Oliver his little goatee he was spose to have, lol! These are all, however, still just sketches. The final versions will be cleaner, have a bit more detail, and will be in print ready format when complete. In the meantime, since I have a ton of work on my plate, I decided to take Sid’s suggestion and cut my posts down to one post per week, which will be the Monday Evening Post, at least until I’ve returned from the San Diego Comicon. It is my hope that by limiting my post, I can manage my workload and return to publishing better material 🙂 We’ll see how that turns out! But in the meantime I am very grateful for everyone’s support as I push through the obstacles :D.
Hope you enjoy the kitties of Katzenworld, and till next time, Enjoy! 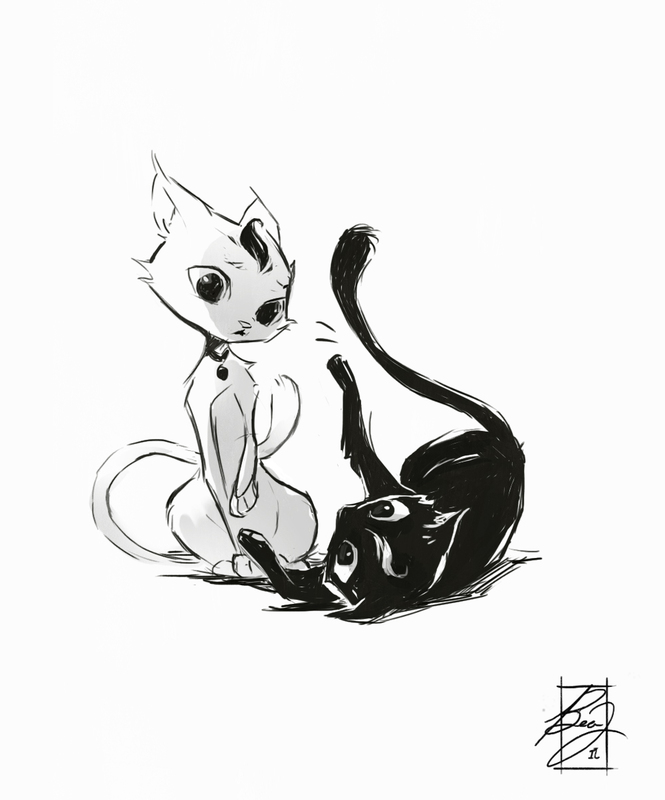 Day 17, I challenged myself and drew two cats– Yin and Yang. In response to my post, Mr. Marc-André Challenged me, to do it again, and asked if I could draw his two cats, Oliver and Nubia. 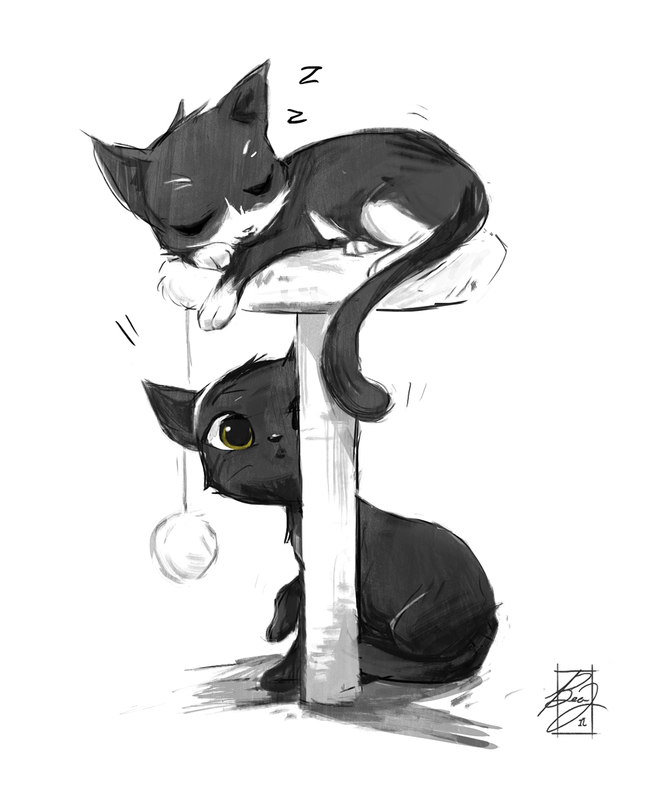 I checked out his blog and after studying Oliver and Nubia a while, I figured this would be a good depiction of them.If I’m right, the black cat is the more playful one? Anyway, Challenge Accomplished Marc-Andre! I hope you like them! A challenge aint a challenge unless it’s a challenge, right? Today’s was one my more challenging days, in terms of sketching. Specially because I don’t usually draw animals. I draw people. That’s my thing >_<; But when you’re doing a challenge, no matter what it is, at some point you have to step outside your comfort zone. This sketch took a lot of work, I needed a lot of references, and I drew it like three times. But also, as it goes with challenges, when you push through, the reward you get is knowing that you accomplished something new.